If you missed it, my somewhat more serious post on Ubergate is here. Everyone has weighed in on "Ubergate," including Loren Feldman, but I have kept with my usual non-trendiness and am just now catching up on the brouhaha. Then again, 99% of the world's population doesn't care about Uber or Sarah Lacy, so I'm not alone. Over dinner, [Uber's Emil Michael] outlined the notion of spending “a million dollars” to hire four top opposition researchers and four journalists. That team could, he said, help Uber fight back against the press — they’d look into “your personal lives, your families,” and give the media a taste of its own medicine. I first heard of this when [Buzzfeed writer Ben] Smith called me for comment over the weekend. I was out late at a work dinner in London and stepped out into the cold to take the call. A chill ran down my spine that had little to do with the weather, as he described the bizarre interaction. I immediately thought of my kids at home halfway around the world, just getting out of their baths and groggily pulling on their pajamas, and how the new line that this company was willing to cross would affect them. This is not the first time that someone has compiled an "enemies list," of course, and it won't be the last. The question is what you do with that enemies list. Perhaps Uber would be better off if it took a more positive approach toward its critics, or perhaps not. But negative publicity can't really help your company, unless for some reason you're intentionally courting it. On the other hand, based upon an admitted reading of only a single article, it appears that Pando Daily (Lacy's outfit) has a longstanding animosity toward Uber. As a writer, I'll admit that I love nothing better than to return to a cherished battle and fire yet another salvo at a particular target. But repeated volleys have diminished effectiveness over time. Years ago, TechCrunch weighed in on women who complain and complain and complain about sexism. One of the best speakers I’ve heard at Summer Davos was also one of the most successful people, and he came from a far more challenged background than the average American. His advice in an off-the-record mentor session was this: “The most successful people in the world never complain. I’m tired of people saying their opportunities were taken away from them by others.” Amen. Now I'll grant that this is a different issue than digging up dirt on someone. Which is just as well, because the 2010 TechCrunch article wasn't written by Emil Michael or Michael Arrington or Bill Cosby. The article was written by someone else. This is a follow-up to my earlier post about two people who were fired from volunteer jobs, possibly because of their religious beliefs. In this new story, Gary Vander Boegh was a landfill manager employed by Weskem. During that time, he reported that the uranium enrichment plant had been illegally dumping radiological waste, contaminating the groundwater. This revelation qualified Vander Boegh for whistleblower protections. In 2005, Weskem lost that particular contract to a new company, EnergySolutions. Vander Boegh applied for the landfill manager job with the new company, and was not hired. He claims that he wasn't hired because of his previous whistleblower activities, and that the failure to hire him was employment discrimination. But the 6th Circuit (we saw this circuit earlier) disagreed. The 6th Circuit affirmed Tuesday that Vander Boegh cannot sue EnergySolutions for employment discrimination because he was just an applicant - not an employee. "The plain meaning of 'employee' does not plausibly extend to Vander Boegh because he never worked for EnergySolutions," U.S. Circuit Judge Richard Griffin said, writing for the three-judge panel. Now there are legal protections for job applicants - if a particular company continuously refuses to hire black women, the applicants have a case. However, it doesn't appear that whistleblower protections apply here. There is often a lot of misunderstanding about the protections that we have. For example, as I noted in an August 2013 post, there is no Constitutional or Federal protection that prevents a private employer from firing an employee because of his or her political views. Michael Italie was fired by Goodwill Industries in 2001 because he was running for mayor of Miami on the Socialist Workers Party ticket. Italie quickly discovered that while he couldn't be fired for his religious views, and while a government employee couldn't be fired for his or her political views, a private employer could very easily be fired for political views. So if you're a passionate Republican who wants to work for George Soros, don't bother. However, religion is clearly protected by Federal and state law, and you can't fire someone because of his or her religious beliefs. Take the case of Michael Marie and Mary Cabrini, two nuns who are members of the Order of the Missionaries of the Sacred Heart. If you think that all Roman Catholics have identical beliefs, think again. These nuns believe that Vatican II was a mistake, and that the Mass should not have been changed. Anyway, these two sisters volunteered with both the Red Cross and the Ross County Emergency Management Agency. In both of these organizations, a woman named Mary McCord holds high executive position. McCord is Catholic, but is not a traditionalist Catholic. The two nuns claim that McCord not only prevented them from being promoted, but also fired them from the Ross County Emergency Management Agency. Assuming that McCord orchestrated these job actions for religious reasons, this initially sounds like a clear case of religious discrimination, where two people suffered employment discrimination because of their religious beliefs. "Even if RCEMA and the Red Cross would have threatened to sever their volunteer relationship with the Sisters upon their refusal to adhere to a set schedule or to accept the tasks given them, this does not necessarily show that the agencies exercised any real control over the Sisters. Unlike most employees, the Sisters are not economically reliant on RCEMA or the Red Cross in any real or measurable way," since they receive all living expenses from their order, the 28-page opinion states. Now it's quite possible that this could be overturned on appeal, or that a different court may reach a different conclusion in a similar case. But for now, it appears that you have to actually be an employee to suffer employment discrimination. Management by fear. The image that is conjured by those words is one that is, to put it mildly, unpleasant. I remember a consulting job that I had decades ago, where the supervisor was making one of his subordinates physically ill. Several months later I ran into the subordinate, who was now smiling - her fearful supervisor had left the company. Why do companies install so many stupid rules and policies? Fear is the reason. Fearful managers don't trust themselves to hire people they could trust to do the right thing. There is a tremendous amount of fear in many corporations, institutions and startups. Small companies are not immune to fear. Bad employment policies are like bad laws - long after the threat has gone away, the policies are still there, and thirty years later, you still have to get manager approval to replace your name badge. Can you think of any examples of management by fear at your company? I don't talk about BIG DATA all that much - not because I am not trendy, but because I rarely have anything to say about it. Occasionally the topic will come up, but it's not a major theme in my business blogging. After transforming customer-facing functions such as sales and marketing, big data is extending its reach to other parts of the enterprise. In research and development, for example, big data and analytics are being adopted across industries, including pharmaceuticals. Research firm Gartner said that big data analytics will play a crucial role in detecting crime and security infractions. By 2016, more than 25 percent of global firms will adopt big data analytics for at least one security and fraud detection use case, up from current eight percent. But if we focus on BIG DATA, we may miss something. Qvidian's Amanda Wilson makes this point in a blog post geared toward sales operations professionals, but applicable to many of us. Data is being captured at almost every point in the marketing and selling process, so the amount of information we can gain on what’s going on is at an all-time high. But the key is to not just look for the new analytics tool of the month, or dazzle your leadership with pretty dashboards and visualizations. Because data doesn’t make decisions, people do. Read more of Wilson's comments here. And don't forget Sujatha Das' point that data is just the first step to wisdom. On Monday, I wrote a post that discussed various foods - or not foods, depending upon your point of view. One of the items discussed was a product from Hampton Creek Foods called Just Mayo. As I noted on Monday, the innovation of Hampton Creek Foods is that their products are produced without using animals. Therefore, Just Mayo contains no eggs. I have to agree mayo contains eggs. If it doesn't contain eggs it shouldn't be called mayo, it's a mayo-like substance. Unilever, the parent company of Hellmann’s, sued a San Francisco-based Hampton Creek for false advertising over the company’s use of the word “mayo” in its eggless sandwich spread’s name. According to the suit, Unilever claims that the name of the Just Mayo spread misleads consumers because regulators and dictionaries define mayonnaise as a spread that contains eggs. According to Consumerist, Hampton Creek agrees that mayonnaise is a spread that contains eggs - which is why its product is not called Just Mayonnaise. However, Hampton Creek could do a lot more to stop Unilever. In fact, Hampton Creek could boldly pronounce that its product is NOT mayonnaise, and if you want to buy true chicken-based mayonnaise, Unilever would be happy to provide it to you. The 346 million chickens used each year for their eggs, called “laying hens” by the industry, endure a nightmare that lasts for two years. 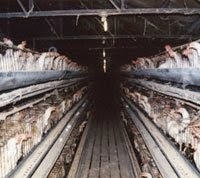 At just a few days old, a large portion of each hen’s beak is cut off with a burning-hot blade, and no painkillers are used. Many birds, unable to eat because of the pain, die from dehydration and weakened immune systems. After enduring these mutilations, hens are shoved into tiny wire “battery” cages, which measure roughly 18 by 20 inches and hold five to 11 hens, each of whom has a wingspan of 32 inches. Even in the best-case scenario, each hen will spend the rest of her life crowded in a space about the size of a file drawer with four other hens, unable to lift even a single wing. Now this is serious. It has a serious name - Photonic Fence. I'm sure [that] Dr. Wood acted all serious in the meetings, talking about combating malaria and saving the world, but once he got away from the money people, he jumped up in joy and started talking about really kewl laser action! Well, the idea has continued to evolve, and now it's no longer a hand-held laser. The new prototype is called the Photonic Fence. The device creates a virtual fence that detects insects as they cross its plane. Once detected, the photonic fence uses the insect’s wing beat to determine if it’s a mosquito, identify if that mosquito is female (only females bite humans), and then shoot the mosquito out of the sky with a laser. Photonic fence devices could be set along the perimeter of villages or buildings to control mosquito populations without interfering with human traffic. A fence that kills females - at first I wondered if I was reading about #GamerGate. But the Wikipedia article on the technology links to criticism of the idea from Dr. Bart Knols. Among other things, the requirement for a stable power supply to operate the Photonic Fence makes the whole idea a non-starter in those areas of Africa that are worried about malaria. Some, but not all, businesses will be closed in the United States on Tuesday, November 11 for the holiday that we call Veterans Day (and that we used to call Armistice Day, back when we thought that the World War was the war to end all wars). Yes, I know that you call it Remembrance Day, but we do our remembering in late May, on the day that we call Memorial Day. This gives us a holiday in May. No, most of us don't celebrate May Day, because we're not a bunch of Commies. Back in March 2009, right about when this particular blog was starting up, I wrote a post that referenced another post in a blog called Small Business Labs. I haven't looked at Small Business Labs in years, but I peeked at it recently, and saw a post entitled The Future of Food. And I haven't even brought up the food (or "food") that was intentionally given the unfortunate name of Soylent. Put simply, Soylent 1.0 is healthy, easy, affordable food. Soylent 1.0 is a simple, efficient and affordable drink that possesses what a body needs to be healthy. Soylent 1.0 is a new option for maintaining a balanced state of ideal nutrition, just like traditional food. Soylent is a convenient powder that is mixed with water. Some tout Soylent as the future of food, but David Tao (who experienced bloating and who aggravated his throat in an admittedly short three-day test) is less enthusiastic. Soylent may revolutionize nutrition for some, but as my experiences indicate, it’s definitely not for everyone. Yes, there are numerous examples of people who switched to an all-Soylent diet and felt great doing it — including its inventor. But while my three-day trial wasn’t enough to draw conclusions about consuming Soylent long-term, the early side effects have scared me off for now. Here's how Impossible Foods describes the process. We looked at animal products at the molecular level, then selected specific proteins and nutrients from greens, seeds, and grains to recreate the wonderfully complex experience of meats and dairy products. For thousands of years we've relied on animals as our technology to transform plants into meat, milk, and eggs. Impossible Foods has found a better way. Well, at least it looks better than Soylent. But how does it taste? According to IGN.com, a Wall Street Journal taste test (behind a paywall) characterized the taste of the Impossible Cheeseburger as "something like a cross between a turkey burger and regular beef burger." Small Business Labs also talked about food made from bugs, but hey - I'm about to eat. The essence of Popovich's job is to encourage other men to amass four numbers - the San Antonio Spurs' scores in four NBA final games - and ensure that those four numbers are higher than the scores of the other team in the NBA finals. The NBA finals is a best of seven series, so if you win four games - or have four higher scores than the other team - you win the championship. If Popovich can only amass three higher numbers (meaning that the other team has four higher numbers, or four wins), then Popovich didn't do his job. If the Spurs don't even get to the NBA finals, then Popovich didn't do his job. Incidentally, this is why I was never bent out of shape when Popovich sat his stars during the regular season. His goal is to win four NBA finals games. His goal isn't to make people at a Miami Heat regular season game happy. Heck, his goal isn't even to make his own fans happy during the regular season. His goal is to win the finals. My job is slightly different from Popovich's job, but it can also be boiled down to its essence - something that I did in a comment on a Colleen Jolly post. I take contributions from many people and create a pile of paper. Sometimes, the "judges" think that my pile of paper is better than the other piles of paper. Now you can also extrapolate jobs into abstractions. Popovich makes San Antonio citizens happy. I save lives by keeping dangerous criminals off the streets. Maybe if they keep the doors open for that long, someone will wander in. Officials decided to open the stores earlier this year after customer feedback indicated shoppers wanted more flexible shopping hours during the holiday, Kmart spokeswoman Shanelle Armstrong wrote in an email to The Huffington Post. But, according to Forbes, MasterCard has identified another reason for the earlier and earlier shopping hours. Every big box chain is therefore competing to be the first port of call for shoppers as they battle long lines, cold, fatigue, and sharp elbows — not to mention dwindling funds. So even if few people are truly going to Kmart these days, think how many wouldn't show up if Kmart opened Friday, and the customers had already gone to Walmart on Thursday evening. Russia may develop a technological center, but it won't be a "Silicon Valley"
Fortune has discussed Russia's annual Open Innovations Forum with the headline "In Russia, an attempt to build its own Silicon Valley on the Moskva River." But by the time you've finished reading the first paragraph, a quote from Dmitry Repin illustrates the error in the headline. While Silicon Valley in the USA certainly includes a confluence of people, government is (at least outwardly) absent. Remember my post from last year that quoted Chamath Palihapitiya? If companies shut down, the stock market would collapse. If the government shuts down, nothing happens and we all move on, because it just doesn't matter. Stasis in the government is actually good for all of us. It means they can neither do anything semi-useful nor anything really stupid. Would YOU want to be the Russian startup head that tells Putin that things would be better if he did nothing? Another case in which a leader steps before the cameras after the tragedy. Another case in which the leader's stature is enhanced as a result. And as a result, people are using this as a teaching moment to suggest how leaders should respond in the future. Michele Lutz's first derived lesson? Lutz goes on to explain what she means, but her explanation doesn't match her initial two-word statement. Why not? Because often when we are truly human, we not only expose our greatest strengths, but also our weaknesses and our warts. I've already talked about my favorite example of a leader who was honest - and human - and who received a ton of negative press as a result. BP's Tony Hayward was certainly human and honest when he said, "I want my life back," and I would probably have done the same. But that response, to put it mildly, wasn't popular. Another example was exhibited by someone who is usually in control in front of the cameras, Paul McCartney. It must be wonderful to be McCartney's publicist, since the man is gifted in staying on topic and saying the "right" thing. When his long-time songwriting partner John Lennon was murdered, a shocked McCartney was questioned about it. When one looks at his human response, it doesn't seem "right." In this case, McCartney's brain was on overload, and he was unable to come up with the right thing to say. Decades later, even McCartney fans debate the topic. It sounds like we don't want our leaders to be human, but to be superhuman. 2007 and 2008 were a long time ago. Part of my reluctance to "twitter" the IAI back then was due to the fact that the online services at the time seemed more targeted to individuals than to companies. With some notable exceptions, the trendy part of the tech industry was focused on consumer rather than enterprise business. While this persists even today, there are more and more examples of enterprise use of social media. Even my vertical market, the automated fingerprint identification system industry and related industries, is starting to use hashtags. In addition to #99IAI (mentioned here), one of my company's esteemed competitors used a hashtag for its own user conference. Well, sort of - the company used the hashtag once, and a participant used it twice. But that's better than many other companies, I guess. How did we capture the excitement of the conference? We utilized social media to communicate with event planners and attendees. The Grainger Show hashtag (#GraingerShow) had more than 56,000 impressions on Twitter. Interestingly enough, the "we" in that passage was not Grainger, but Bags Inc., who supplied bags to the Grainger Show; Grainger's own press release didn't mention the hashtag. Grainger gets it done...by outsourcing to the nimble. But an online presence will become more important. At about the same time (early 2014) as #GraingerShow, Alex Kantrowitz was discussing future B2B trends. When compared to editorial content and vendor-created content, social media is currently the least critical source of information for IT buyers, the [IDG Connect] study found. But in two years, buyers expect that equation to flip as they increase the weight given to social media from 31% to 37% for influencing investment decisions. In the same period the weight given to editorial and vendor content will drop to 31% and 32%, respectively. Kantrowitz further noted that even then (January 2014), 86% of all IT buyers were referring to social media, even if it wasn't a major impact on their decisions - yet. But if you're in a small vertical, how do you find your B2B information needle in the online haystack?